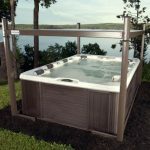 Common Questions: What Are The Typical Dimensions of a Hot Tub? One of the many benefits to living in the information age is that you can thoroughly research every purchase before you make it. 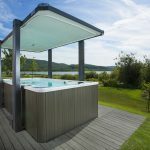 If you are planning to purchase a new hot tub this year, chances are that you have already been doing your research. You have looked at all of the different brands, models and features that are available to you. But one key piece of research that you might not have considered is size. You shouldn’t overlook it. In fact, the size of the hot tub should in fact be a key factor in your purchase. Put simply, hot tubs fall into three size categories: small, medium and large. A small hot tub typically holds 2 to 4 people. They range in size from 5’4” x 5’4” to 7’ x 6’8” and have a wall height of about 29” – 35”. These tubs are great if you don’t plan to have many guests in your hot tub or if you and your family members are shorter in height. You can still get the same great features as a larger tub, just in a more compact size. Medium tubs are what most homeowners choose. They seat about 5 – 6 people and vary in size from approximately 6’6” x 6’4” to 7’9” x 7’9”. Their wall height ranges from 33” – 37”. Medium sized hot tubs are great for families and those who occasionally have guests over. That leaves the large hot tub. 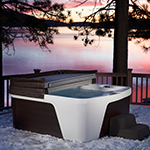 Larger hot tubs are ideal for those that love to entertain. 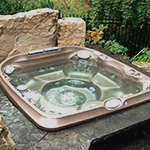 Hot tubs that are between 7’ x 7’ and 9’ x 9’2” are considered large hot tubs. These tubs accommodate 7+ people and can be as deep as 38”. They are definitely the party tubs. Now that you know some approximate sizes, let’s look at some things that you need to keep in mind when deciding which tub size is right for you. You obviously need to know that the hot tub you’re considering will fit in your space. We aren’t just talking about if your deck or patio is large enough for your tub. You also need to make sure that the infrastructure under your tub can support the weight. Is there delivery access for the size of hot tub you want? Your tub may fit perfectly on to your deck, but you have to be able to get it there first. 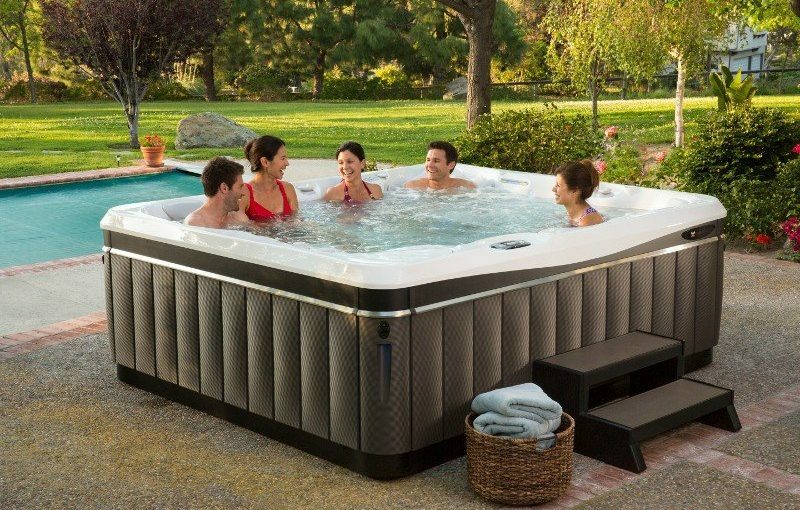 Make sure that the hot tub you choose will accommodate the number of people that will typically be soaking in your tub. If it will just be you and your spouse enjoying the hot tub you can opt for a smaller tub, leaving you more room in the budget for additional features. If you have a large family or regularly entertain guests you will probably want to opt for a larger tub. Even though your daily soaks might just be you, you want to think about entertainment, too. Nothing is worse than getting a new hot tub and quickly deciding it isn’t large enough. Your size will also play a factor in how large of a hot tub you want to get. Typically, people want the water in a hot tub to hit them around the upper part of the chest. If you are very tall, you will want to consider a deeper tub. On the other hand if you are very short you may opt for a more shallow tub. If the people who will be enjoying the hot tub are extremely varied in height, it is best to go with a depth that is most comfortable for the taller person. There are a number of spa seats and cushions that you can buy to make the tub more comfortable for a shorter person, but there is not much that a taller person can to do to increase the depth. 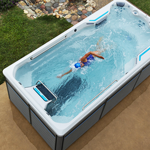 The size of your new hot tub is definitely an important factor when you are deciding which hot tub is right for you. You can read about size all day long. You can even get out the measuring tape and lay things out, but there is absolutely no substitute for seeing the tubs in person. So, visit us at Texas Hot Tub Company. Experience the various sizes of our hot tubs for yourself. Then head home with your tape measure and decide which tub will work best in your space.